It may be too familiar to notice, but when you look closely at an SLR camera, you will find that it actually has a very complex design. The lens, pentaprism, grip and different shapes and sizes of buttons and dials — all of the components have their own distinctive functions, and are set together in a very limited space. When you try to put all of these functions together in a single unit that can easily be held in the hands, you naturally must use many curves. In fact, this is the trend in modern SLR camera design. The PENTAX K-1 has a unique design that distinguishes itself from other SLRs. While it has an extremely compact design, its design is also impressive and quite original. What kind of processes did the designers use to work out this final design? The current design team consists of designers from both RICOH and former PENTAX. The PENTAX K-1 was the first camera designed by this joint team. First, the design team began to analyze the product concept, led by a veteran of more than 25 years of PENTAX SLR camera design. In addition to the group of designers assigned to the PENTAX K-1, he also encouraged all other designers to join in the discussions, and contribute their ideas. The first concept was to refine the design of the PENTAX K-3, which featured the traditional PENTAX K series design. This would create a sense of both continuity and evolution of the K series. From the marketing perspective, this was the most plausible choice. The second concept was to work out a design that would emphasize the flagship model image. By integrating visual elements from past flagship models and the PENTAX 645Z, this was aimed at designing the ultimate PENTAX SLR camera form, and optimizing its attractiveness as an SLR camera. The final concept was to create a totally new design for a top-of-the-line model. This concept was intended to emphasize originality by integrating new design elements in the camera’s details, while minimizing the traditional SLR camera image and set it apart from other K-series models and the PENTAX 645Z. Based on these three concepts, the team drew numerous sketches of the different variations for another in-house presentation. Even though a marketing-oriented approach was important, PENTAX would not accept any concept that wasn’t first of all beneficial to users. When considering the great expectations of the Pentaxians — an affectionate name given to PENTAX camera enthusiasts — neither the concept of a PENTAX K-3 lookalike, nor that of excessive innovation would be the right choice. PENTAX’s final choice was the second concept, with a goal of designing the ultimate PENTAX SLR camera form. If he merely re-created a pentaprism form from the film-camera era, the result would merely be retrospective. So he came up with a plan to revise the shape of the plane that carries the PENTAX logo. When looking at this plane from the side, it becomes evident that it was very meticulously designed. With film-camera pentaprisms, the PENTAX logo was usually engraved on a flat surface. With the PENTAX K-1’s pentaprism, however, it is engraved on a cylindrical surface, successfully creating a more modern image while eliminating a sense of retrospection. Without meticulous attention to details, it would only have been a mere remake of a film camera. The PENTAX K-1’s pentaprism, however, gives a sense of sharpness. It’s a powerful design that transformed a traditional form into a modern design. At first, the designer was planning to adopt a structural design similar to that of the PENTAX K-3, in which pentaprism and an eyepiece sections were integrated into a single housing using a slanted plane. Once the mockup model was made, however, the pentaprism housing looked too tall and heavy, hampering the operability associated with an SLR camera. While it provided a sense of continuity with the PENTAX K-3, the designer didn’t appreciate this tall, heavy form. He found the solution in the history of PENTAX cameras. 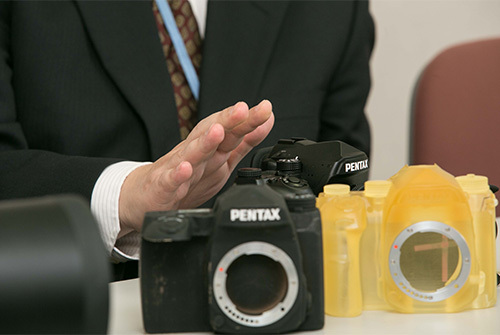 The PENTAX 645D, which he worked on in the past, remained in his imagination. This camera also had a large pentaprism and long eyepiece optics. Rather than integrating these two components into a single-piece configuration, he had assembled them in a way that exposed the distinctive structural features of the both. This allowed him to create a form that was striking to the eye, and not too monotonous. He wondered if he could apply the same arrangement in the PENTAX K-1. After experimenting with this arrangement, he was able to eliminate the top-heavy appearance that had bothered him. He could also minimize the height of the pentaprism’s slanted backside by cutting it short of the eyepiece section. In the end, he created a pentaprism shape that provided the desired sense of innovation as well as lightness. The PENTAX K-1’s designer also paid close attention to the camera’s grip. Although the camera is small considering its full-frame format, it still has a solid heft with a lens attached. The team wanted to come up with a grip design that would minimize arm fatigue even during extended shooting sessions. The team believed that their best example to work with was the PENTAX 645D, because its grip has been highly praised by users for its holding comfort, despite the considerable weight of body and lens combined. In modern camera design, designers normally draw the shape of a grip using 3D CAD technology, then create a mockup on which they can make minor modifications. 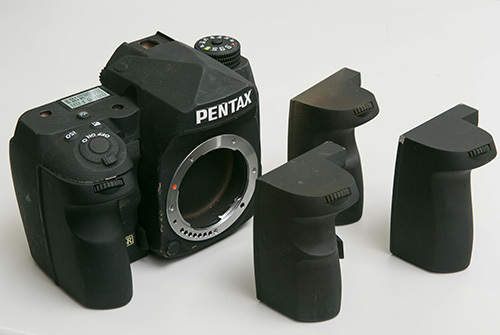 With the PENTAX 645D, however, designers opted for the old-fashioned technique of creating a clay model first. Human hands differ in size, and fingers vary in length. The shape and size of the human hand is different from one person to another. By either adding or removing clay in response to each volunteer’s opinion, the design team could figure out the greatest common size of a human hand. The team then input the measurement of the final grip shape into a computer using a non-contact image scanner to create a 3D CAD image. “The PENTAX 645D’s grip is extremely popular among its users,” says the designer. “We used this grip as a base model, then added some design elements from the PENTAX K-3’s grip. We also listened to many colleagues who expressed a strong interest in the grip design. We believed that it was the best approach for finding the ideal grip design.” From the size and thickness of the grip to the shape of the depression where the user places the index finger, and the height of bulge that holds the middle finger, all imaginable factors were actually examined by the volunteers using different mockups. 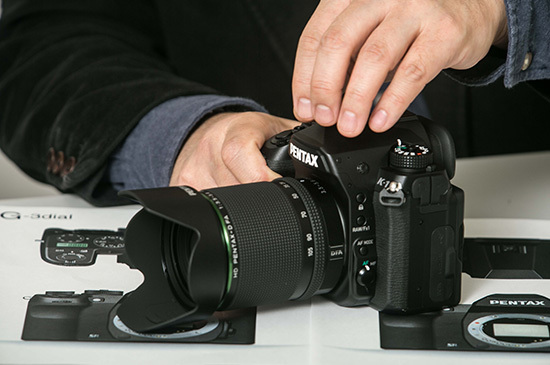 After a long series of trials, one mockup won out as best direction for the PENTAX K-1’s grip. It provided excellent thumb hold, which minimized arm fatigue when the camera was positioned vertically, while ideally sized to prevent interference with control dial operations. The PENTAX K-1 inherits many design elements from past PENTAX K- and 645-series models. The backbone of its design is PENTAX’s camera design history, which has continued from the film-camera era to today. The PENTAX K-1 provides universality beyond the age; it has a symbolic form that clearly distinguishes itself from other brands. PENTAX wants to provide users with a camera that defines their lifestyle and expresses their personality, and deliver a camera which Pentaxians will grow more affectionate toward over the years, rather than the one they lose interest in, and which quickly becomes obsolete. 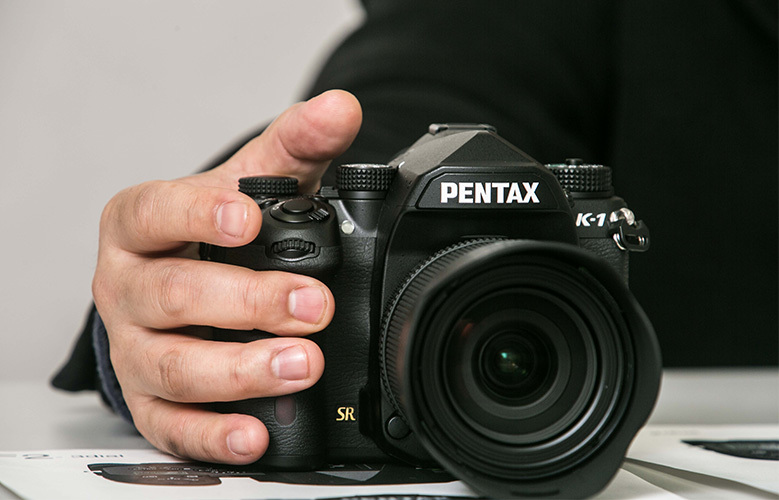 The PENTAX K-1 is the very camera embodying the belief and devotion of the entire design team.